The Times Top 100 Graduate Employers is the definitive annual guide to Britain’s most sought-after and prestigious graduate employers..
offers the best opportunities for graduates?". But which organisation has been voted Britain’s top graduate employer for 2018? Who are this year’s highest-climbers and which of the country’s leading graduate employers are new entries in the latest Top 100? When the first Top 100 league table was published in 1999, Accenture topped the rankings and just two other employers, the Civil Service and PwC have made it to number one since then. 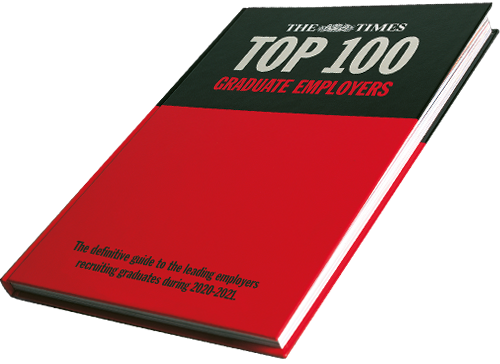 More than 70,000 copies of the 2018-2019 edition of The Times Top 100 Graduate Employers directory have been distributed free-of-charge to student job hunters at fifty key universities across the country and are available to buy for £19.99, exclusively from Amazon. The BBC has been rated as one of the UK's top ten graduate employers fourteen times over the last twenty years, finishing 12th in the Top 100. This year, Clifford Chance has risen seven positions to 36th place. It is the most successful law firm in the history of the Top 100 rankings. MI5 has remained in the Top 100 for the past twelve years, this year placing in 79th position. The NHS is one of the most successful public sector employers in the Top 100, and has solidified its position as number seven in the rankings. BMW Group only entered the Top 100 three years ago, but it has managed a notable rank of 87th this year. Pinsent Masons is a new entry at 99, demonstrating the success of law firms in the Top 100 in recent years. After twelve years in the top ten, Aldi is one of the big hitters in the Top 100, and has maintained its third-place position in 2018. BP is one of three oil and energy companies to appear in the Top 100, and is the sector's most successful organisation in the history of the Top 100. Accounting and professional services firm Grant Thornton has been a consistent member of the Top 100, finishing 86th once again in 2018. ExxonMobil has featured in the Top 100 since it was first published in 1999, and is now ranked in 61st position. GSK has been a consistent high-achiever in the past twenty years of the Top 100, and 2018 and marks its second year at its highest rank of 10th place. Siemens has featured in the Top 100 thirteen times in total. They plan to offer up to 80 graduate jobs in 2018. The Bank of England has climbed 29 places in the Top 100 since 2015. AECOM is one of half a dozen engineering companies to appear in the Top 100 this year, and has been in the rankings for four years running. Law firm CMS has moved up 10 places in the Top 100 this year, to mark their highest ever ranking of 89. Engineering firm Atkins has placed in the Top 100 for fifteen years running. This year, it has solidified its position in the top half of the table, ranking 45th. Innovative technology company Dyson are one of the most talked-about graduate employers at the moment, and this year they've made it to the top half of the Top 100. Wellcome joined the Top 100 in 2015, and - after rising 14 places since last year - has now reached its highest position of 67th. Local Government run the National Graduate Development Program, the NGDP, which offers 140 graduate jobs a year. After just missing out on a ranking in 2017, British Airways re-entered the Top 100 flying high at 82nd place. Since its entry into the Top 100 four years ago, Amazon has had a meteoric rise of 58 places to reach 23rd this year. Well-established graduate employer Airbus has seen steady improvements in the Top 100 over the past few years, climbing to 51st position for 2018. Tesco has maintained its position in the top half of the rankings this year, and is the third most successful retail organisation in the history of the Top 100. Online fashion retailer ASOS is the highest ranked new entry in the Top 100 this year, coming in at 52nd place. Arup, the multinational engineering company, has consistently ranked in the top half of the Top 100 in the past decade, finishing 27th once again in 2018. L'Oréal has seen great success in the Top 100 over the past 20 years. However, this year it has seen a surprise drop to 85th in the rankings. This year, Sky has achieved in its highest position ever, jumping up 18 places to enter the upper third of the Top 100. Signing-up for The Times Top 100 Graduate Employers website is quick and easy - just complete the following details about yourself and the Top 100 employers that you're interested in. Once you're registered, you'll have full access to the Top 100 website and will receive regular email updates with news about the employers you're interested in, their campus recruitment events and application deadlines, as well as information directly from individual graduate employers. Which of these employment areas are you most interested in? Which Top 100 graduate employers would you like to hear more information about? including details of their local recruitment events, application deadlines and their latest graduate vacancy information. These employers may also email you directly with information about their graduate recruitment programmes. By clicking 'Sign Up' you are giving consent for your contact details and preferences to be shared with organisations you have ticked above and for The Times Top 100 Graduate Employers to use your data to send through regular email newsletters. Full terms and conditions can be found here.